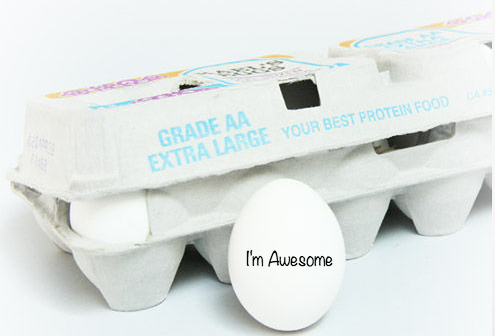 We’ve all heard that eggs are the “perfect protein,” but the benefits of eggs go far beyond your body! At Passanante’s Home Food Service we’re always looking for cool tips and tricks to make life interesting. We’ve pulled together 5 things we doubt you knew about eggs — because who doesn’t love eggs?! 1. Double Delicious — Have you ever cracked an egg and to your surprise (and thrill) out came two yolks, or “twins” as I called them as a kid? Eggs with two yolks are typically either produced by older hens with extra large eggs, or by young hens whose egg production is still not regular. These double-yolked eggs are pretty rare, and frankly awesome, but on the flip side, every once in a while a hen will lay an egg with no yolk at all! “Uhmm sunless?” -said no one, ever. 2. Long Lasting — There are few things worse than food poisoning so it’s no surprise that most people pay close attention to the “Best by” dates; but with eggs you can relax a little. Did you know eggs are okay to eat up to 3 months after they’re laid? The “Sell By” date is typically 30 days after the egg is laid. The “Best By” date is 3-5 weeks after the “Sell By” date. Since eggs have a 3 month window where they’re safe to eat, this means you have approximately 3-5 weeks after the “Best By” date to safely consume the eggs. Good to know! 3. Good For Fido’s Toothy Grin — Egg shells are a fabulous source of calcium and can be used to strengthen your dog’s teeth and bones! Next time you make scrambled eggs for the family keep the shells and allow them to dry in the oven on 250 degrees for about 30 minutes. Toss the dried shells in a baggy and crush them into a fine powder with a rolling pin. Come doggy dinner time, mix the egg shell powder in with the dog food and give your pup an awesome boost! 4. Super Cheap Skin Care — Have trouble spots on your skin? Here’s an easy and CHEAP home remedy. Put an egg shell in a cup of apple cider vinegar and allow it to soak for a couple of days. Dab the mixture on blemishes, irritations, or itchy skin to relieve discomfort and reduce redness. 5. Friend to your Ferns — Many people crush up egg shells and use them as an inexpensive and calcium-rich fertilizer in their gardens, but the shells aren’t the only good-for-plants benefit that comes with an egg. Next time you hard-boil a couple of eggs don’t pour out the water! Use the calcium rich hard-boiled egg water to water your plants — especially if you’re watering solanaceous plants including tomatoes and peppers. Want a FREE gourmet food sample? Click here and we’ll show you what we’re all about! This entry was posted in Food Tips and tagged eggs, Food Delivery Service, Passanante's Home Food Service, Uses for eggs by Passanante's Home Food Service. Bookmark the permalink.